Following the removal of gluten free bread off prescription I am now making all my bread and this is one of the best yet with a crispy crust and spongy interior. It needs toasting to refresh from day two but tastes like the real bread I remember from 19 years ago pre coeliac. 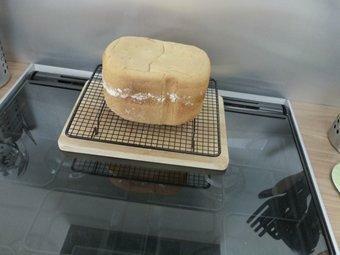 Its made from Doves farm white bread mix in a bread maker and takes 2 hours. I have also been making Buckwheat pancakes with some good results so not to bad. Still reeling from the shock of seeing 6 slices of gluten free sourdough bread for £3.20 in waitrose and Aldi have stopped doing GF bread now. Coop and Sainsburys still sell GF bread. I suppose GF flour has gone off prescription as its easier to buy..and where you have to pay for prescriptions,probably cheaper. The GF bread in Sainsburys is £2.80 a loaf which is too much for me at present and the prescription flour had washed wheat in it at less than 20 parts per million so the bread used to rise like real bread. Its just another thing to do on top of everything as things like buckwheat are naturally GF but they are grown and processed along side wheat so can't be certain GF. I've turned label reading into a hobby. It does look like a good loaf. Better than those things you see at the supermarket. I didn't know you could get bread on prescription. Crazy!